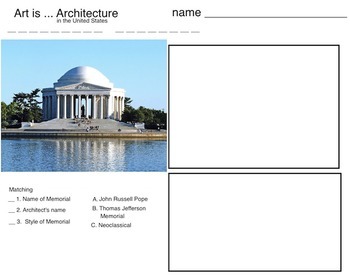 You will receive in this packet 6 pages of Favorite US Patriotic Architecture in the US. 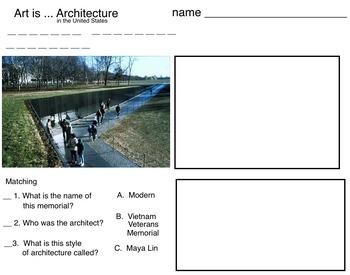 Each page has a picture of the building/monument, blanks for filling in the name, blank spaces for drawing, and a matching quiz. The questions are about the name of the building/monument, name of the architect, name of the architectural style and when it was built. Answers are by process of elimination since there is not a study guide. Blank spaces are for open ended drawings, where the student decides what they want to create. Note: Use of any copyrighted images, artists' photos or artwork is for students enhancement of their Art History and appreciation of Art, in accordance with Fair Use in Education. Most of my art activities are open-ended. If you are not familiar with open-ended art, please download my free Open-Ended Art Information. Remember, if you leave feedback for me, you can earn points towards free TPT lessons. And, I can know if your students liked it.